The California Department of Fish and Wildlife (DFW) is responsible for managing the 752 acre Upper Newport Bay Ecological Reserve, which includes the tidelands and certain adjacent upland areas stretching northwards from the Back Bay Science Center at Shellmaker Road to Jamboree Road. 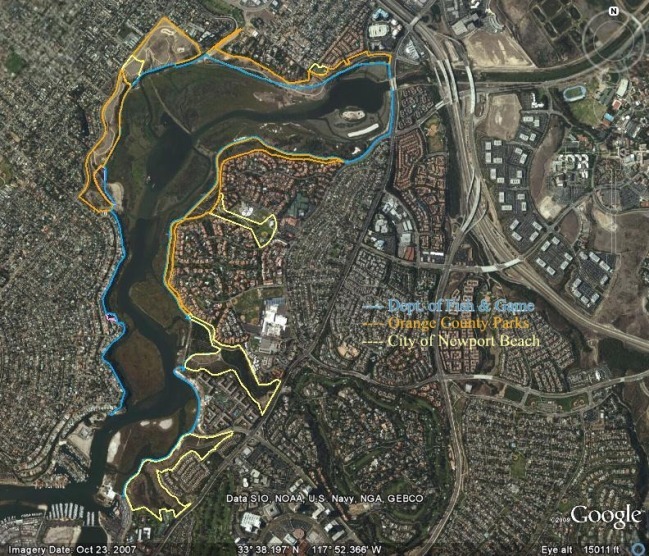 The City of Newport Beach is responsible for managing the roughly 50 acres of Big Canyon Nature Park between the Big Canyon freshwater pond and Jamboree Road, as well as various other parcels such as Newport Valley. The three agencies work collaboratively though the UNB Management Coalition, and the UNB Restoration and Education Teams that operate under the Management Coalition. 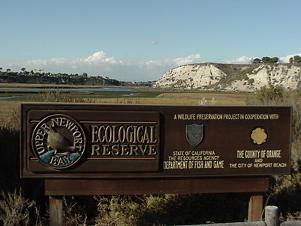 The Newport Bay Conservancy facilitates the Management Coalition. Additionally the UNB Ecological Reserve and Nature Preserve both lie within the scope of the Natural Communities Conservation Plan/Habitat Conservation Plan (NCCP/HCP) for the Central/Coastal sub-region of Orange County. This 38,000 acre reserve system was established to protect specific plant and animal species, including the California gnatcatcher, by implementing a sub-regional adaptive management program to maintain the net long-term habitat value within the reserve system. Though the NCCP/HCP focuses primarily on maintaining, restoring and enhancing Coastal Sage Scrub (CSS) habitat, healthy fringe habitats and linkages are necessary for the sustainability of the biological resources. So marsh and other habitats are part of the NCCP/HCP. See Nature Reserve of Orange County.